You should invest in your health because health is wealth. If you want to stay fit, maintain a healthy wealth or lose extra pounds, it is essential that you track your physical activities. There is a pedometer for walking, a pedometer for running or wearable pedometer to help you monitor your activities. If you want a silent and efficient walking pedometer, you may check out CSX Walking 3D Pedometer Fitness Calorie Monitor. Read more to learn about this fitness tracking device. CSX Walking 3D Pedometer Fitness Calorie Monitor is an accurate and a silent 3D pedometer that is designed to help you track your activity and achieve your fitness goal. This fitness tracking device adds up your steps, encouraging you to do move, walk further each day and set bigger goals. As the name suggests, this is a walking pedometer. If you are aiming to get 10,000 steps a day, CSX Walking 3D Pedometer is for you. Aside from counting your steps, it also calculates the calories you burned and the distance you covered. You can find all the basic features of a regular pedometer in this fitness tracking device. This walking pedometer comes with a simple design and effective functionalities. Here’s a list of its best features. Compact Design – this walking pedometer comes in a compact and lightweight design that makes it easy to wear. It has a size dimension of 75x34x13mm, with a weight of 27 grams. Tracks your activity accurately – this pedometer is equipped with advanced tri-axis silent walk sensor technology that won’t miscount your steps. You can position this in any way you are comfortable, clip it into your hip or place it inside your pocket, bag or purse. You can also wear this on your belt loop with its detachable strong clip and strap. Due to its comfortable design, you can take this pedometer with you anywhere you go and track your daily activity without hassle. Equipped with Walk Sensor Technology – this simple pedometer comes with an impressive Walk Sensor Technology for accuracy. It avoids counting sudden movements as steps. The counter will only count 10 consecutive steps, any number lower than this will not be counted to avoid over counting. Monitor Everything – this pedometer measures your daily steps, count the calories you burned, and track the distance you traveled in miles or kilometers. The unit can be imperial (mile, inch, lb) or metric (km, cm, kg). 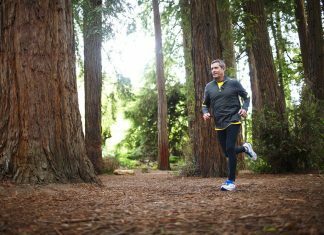 For a more accurate personal reading, you should input your stride length and weight. This tracking device also offers Activity Time that shows your daily active time while walking. 7-Day Memory – this walking pedometer comes with automatic 7-day memory to keep you motivated by allowing you to track your progress for a week. The pedometer also automatically resets at midnight, to give you a clean slate when you track your daily steps, distance, and activity on the current day. Free PDF – To motivate CSX pedometer customers to maintain a healthy lifestyle, Patrick Dale, a renowned fitness writer, ex-marine, fitness trainer and author of three fitness book wrote the book “Walk Yourself Fitter.” This 56-page ebook is especially written for CSX pedometer customers to help them get the most of their walking pedometer. It includes tips on how to get started walking, warming up and cooling down exercises, how to make progress and how to avoid and treat injuries. Apart from this, it also covers nutrition, clean eating and talking your walking to the next level. The download link for this pdf is included in the box. 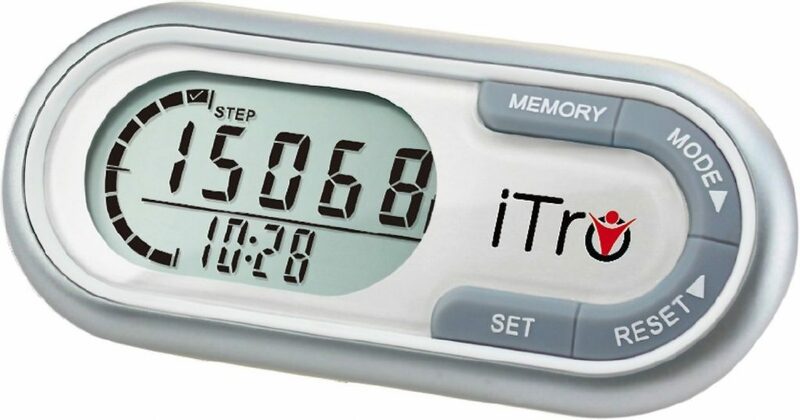 Reach your goals – this walking pedometer displays a progress bar for easy viewing to show you how many steps you have done so far against your daily step target. This feature makes it easy for you to track your progress as it informs you how far or near you are to your daily target. When you reach your daily target, the pedometer will inform you with a flashing LED and beep indicator. The LCD may show some faint background digits. This is normal because of the fresh battery. This will disappear when the battery drops to normal operating voltage. Check out the CSX 3D Walking Pedometer manual here. 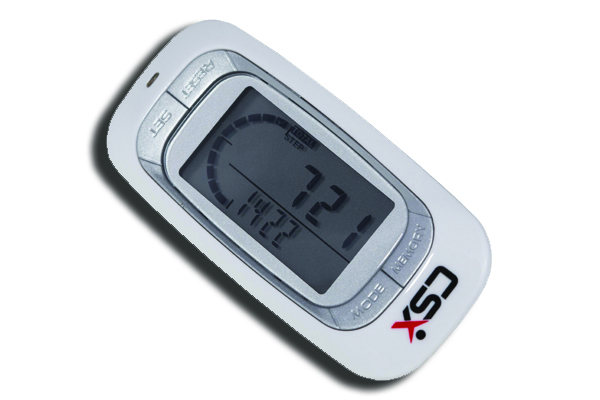 The CSX 3D Walking Pedometer comes with an 18-month limited warranty from the date of purchase. However, the warranty coverage is terminated when you sell or transfer the pedometer. The manufacturer takes care of any defects or malfunctions with a replacement or full refund free of charge depending on their discretion. The warranty does not cover the battery, general wear and tear or any problem that is caused by abuse or misuse. Consequential and incidental damages are not recoverable under this warranty. 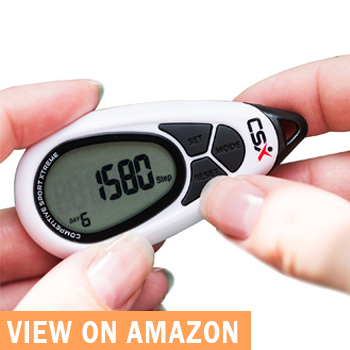 Customers who purchased CSX 3D Walking Pedometer are very satisfied with its performance and quality. They find this walking pedometer to be of great and excellent value. Learn how impressed the users are with this walking pedometer. “Really easy to use and seems very accurate. I don’t have much time or inclination to faff about with gadgets so I really like that it just tells me exactly what I want to know and keeps the data for 7 days. Their customer service has been excellent – with follow-up and an immediate response to my question about the product,” T.Wynne, a verified CSX 3D Walking Pedometer purchaser wrote about his experience with the device. 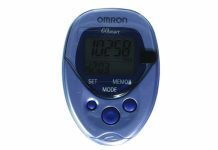 “This Pedometer is small enough to fit in various places on the under garments or pockets without hindering or being uncomfortable. It is sturdy and does what it says on the packet. Nice strong clip to hold it onto a belt of trousers top and a lanyard for the use of if required. 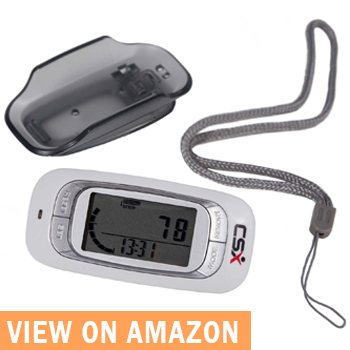 Nice little buy,” Dennis Best, wrote about his CSX 3D Walking Pedometer. Beth another CSX 3D Walking Pedometer user was a proud buyer. She finds this fitness tracking device better than the others on the market. “I bought this product a couple of weeks ago now, and I couldn’t ask for anything more. Great value for money (compared to others on the market), arrived within the estimated arrival time, it was securely packaged and included detailed instructions on how to set it up and get the best use out of it. It was easy to set up and once you get your head around it, it’s easy to use. It comes with a clip and a strap, the clip is easy to fit on the back and easy to remove, I haven’t used the strap yet. It shows your daily steps, total steps, calories burned, distance travelled (you can choose miles of km) and total active time,” Beth wrote. 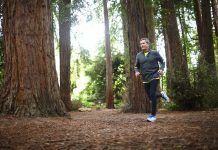 “I have also received an email from CSX direct, ensuring that I have received my pedometer and to check that I am happy with it or whether I have any questions about it. Very friendly email and a nice touch to an online buy which you don’t get very often. Upon replying to this email with my feedback, they have offered me a 10% discount on any CSX products until November this year, which is great! They have definitely gone above what would normally be expected to ensure their customers are happy!” Beth added. If you need a high quality and durable walking pedometer that gives an accurate reading with friendly customer support, CSX 3D Walking Pedometer is a great choice. Customers who use this walking pedometer are very happy and satisfied with it. 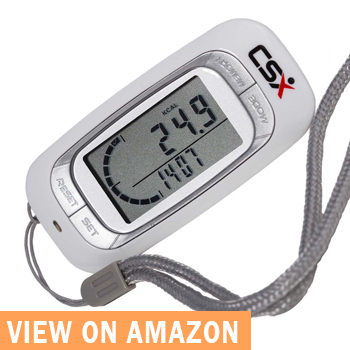 You can purchase your CSX 3D Walking Pedometer here.